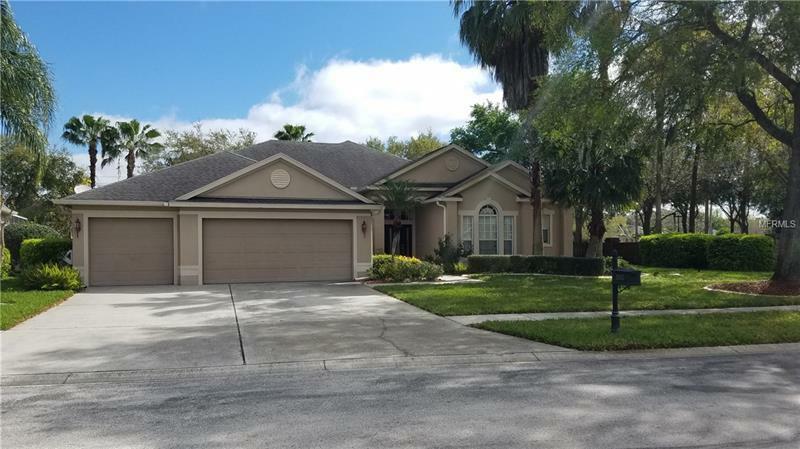 Don't miss out on this contemporary executive open floor plan 4 bedrooms 4 bathrooms 3 car garage pool home that sits on an oversized corner lot with so much to offer. This home also offers an oversize bonus room upstairs that would make a awesome game room and more with a full size bathroom. Want to work from home? No problem in your very own spacious Executive Office space. The bonus room and or Office could be transformed into a bedroom if desired. Relax or Party in the Florida Sun next to your own Screened in Swimming pool. Dine and entertain in your own formal dining room and formal living room. A gorgeous lake is just a walk away to relax by or watch the boats. A public boat ramp is around the corner for your boat. Great for those who have to commute to work! Located just minutes from Fine dining, Shopping Outlet Mall, Wiregrass Mall, Publix Grocery Store, Florida Hospital, Interstate 75, and the Suncoast Express Way which gives you an easy route to Downtown Tampa, Tampa International Airport, professional MLB, NFL, and NHL sporting stadiums, Tampa Bay area beaches, nightly entertainment, and Florida Hospital. This home is a must see and will not last long!! Buyer and/or Buyer's Agent is responsible for their own due diligence, including but not limited to verifying community information and rules, square feet, lot size, room dimensions and taxes, utility data and school assignment.